:: www.peterberger.at :: Articles :: BreezeBrowser template "EXIF+IPTC table"
www.peterberger.at > BB template "EXIF+IPTC table"
You can install the "EXIF+IPTC table" template by downloading the file exiftable.zip and extracting it to your default template directory (which is usually located at C:\Program Files\BreezeSys\BreezeBrowser\templates). You should end up with a directory called "EXIF+IPTC table" underneath the template folder. You should be familiar with BreezeBrowser´s HTML generation feature. If not, please read the online help pages first. 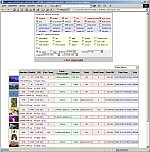 For the HTML settings I recommend that you specify a small thumbnail size (I used 60x50 pixels) with a low quality (i.e. 60) to keep the table clear and fast loading. In the main view you will see the configuration table on top of the page followed by the output table. Whenever you change the settings (checkboxes and pull-down menus) you have to click on "reload table" to update the view. The use of the checkboxes should be self-explanatory. Note that I included an "EV" column which shows the calculated exposure value. This value let you easily compare a series of shots with different exposure settings (shutter, aperture, ISO). This is NOT the light value of the scene, it´s the value you choosed to capture the scene. Next to the file name you will find links to the full EXIF and IPTC data. When you click on the thumbnail image a window opens showing a web sized view of the photo. Underneath the image are again links to full EXIF and IPTC data. In all of these popup windows it is possible to step through the images (use next or previous) according to the currently shown (!) 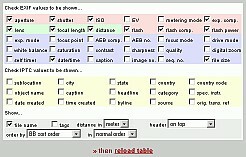 sort order in the main view. At the bottom of the image window there is a link to the original image on your hard disk (the one which was used in BreezeBrowser to generate the pages). Of course this link only works on your local PC but this template isn´t meant to be used for a Web gallery anyway. The default sort order is the one you used in BreezeBrowser during the HTML generation process. You can select any field for sorting, it doesn´t even have to be selected to be shown. If it is shown then the text in that column will be appear in green. You can also sort by the tagged images. If you enable the "Tag" column you can see which images were marked as tagged in BreezeBrowser. The grey frame around the tagged boxes show you the original setting. You can check and uncheck the boxes but keep in mind that every reload of the table will restore the original settings. Read in the next paragraph how to save a modified tag list. Click "OK" in the alert and a new window will appear (don´t worry if it´s blank). In that new window you have to click "View" -> "Source Code" and wait for your local editor to show you the source code. In that editor window you have to save the code in a new text file. That´s all. It´s tempting to use "File" -> "Save As" in the browser window but this will not work. If you save a sort order file then use the extension ".xml". Open BreezeBrowser and import the file with "View" -> "Image Order" -> "Load Custom Order...". If you save a tag list then the file extension should be ".txt" or ".tag". (The export is only possible when the tag column is shown.) In BreezeBrowser you can import the file with "File" -> "Load Tags...". The settings currently used are stored within the URL (page address). So all you have to do is bookmark the page showing your preferred settings! You can store as many settings (bookmarks, favorites) as you like. Alternatively you can copy the URL from the browser´s address field and save it in a text file or use it as a link in an HTML page (like in the example below). Click on the image to see an example with the default settings. This link shows the same example page with different settings (IPTC data). The settings are "stored" within the URL of the link. And this link shows the example sorted by the EV value.